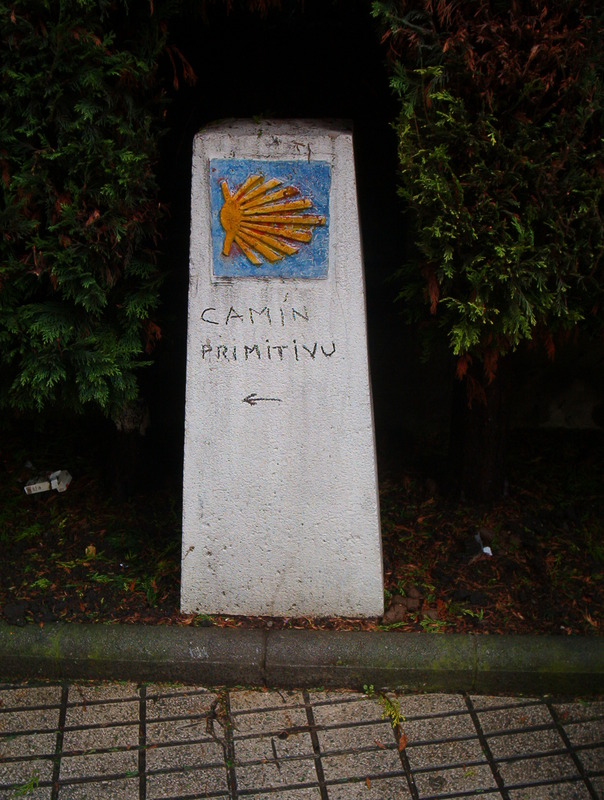 Starting Easter Monday in 2008, Alan (63) walked 308 kilometers of the Camino Primitivo from Oviedo to Santiago de Compostela. It took fifteen days walking with no rest day: I should have liked to take one in Lugo to look around, but had a post-Camino schedule to meet. I used two guidebooks. One that you can obtain through the Spanish language website www.jacobeo.net is the Camino del Norte: Guía práctica del Camino por la Costa y del Camino Primitivo . The other is Eric Walker's guide to the Primitivo, available from the Confraternity of St. James in London through their website, www.csj.org.uk. In addition to these, I consulted but didn't carry my older El Pais/Aguilar edition of the El Camino de Santiago del Norte , which has lots of useful information for planning the walk (new edition up through 2006 available now). Both Spanish guides mention trails overgrown at certain points by evil plants, but in fact Camino support organizations have cleared out all the gorse, blackberry canes, and stinging nettles everywhere in 2008 -- a major blessing to the hiker. Also, in a huge improvement, the Xunta de Galicia has opened an Albergue Provisional in San Román de Retorta, the last stage before Melide. There were very few other pilgrims out on the trail so early in the year, but hostales and albergues were already open for business. I met a group of four Sevillanos in Bodenaya, and a young couple from Valladolid in the Albergue de Peregrinos in Tineo. And also in Tineo I met a man from Madrid who joined me on the rest of the route, became my friend, and without whose company and encouragement I might not have completed this very demanding journey. Beyond these seven Spaniards, I saw no other pilgrims until Melide, where the Primitivo joins the Camino Francès. And there, it was like coming out of a quiet parkland into a street fair: pilgrims and turigrinos everywhere. The Primitivo runs along and through the northern-side foothills of the Cantabrian Mountains. Its terrain and paths range from gentle to strenuous to brutal, but for most of its length, the compensation is the magnificence of this ancient, intensely farmed, and stunningly beautiful landscape. The other reward, far better in many ways, is the gracious and good-natured welcome I encountered all along the path from my Asturian and Galician hosts. For anyone interested in following this ancient route, the first ever to be taken by pilgrims to the tomb of St. James, these pages are an introduction to how to get started, where to stay along the way, some of what you will see, and where to find more information about it. The text and the author's photographs contained in this work are licensed under a Creative Commons Attribution-Noncommercial 3.0 Unported License.